Gatlinburg is a Beautiful Honeymoon Spot Any Time of Year – and These Charming Cabins are Perfect, Too! Planning a honeymoon offers a world of possibilities, but with beautiful and secluded locations in the Great Smoky Mountains and plenty of daytime activities, charming cabins in Gatlinburg provide an unforgettable spot for a honeymoon. Choose between luxurious chalets and cozy cabins in Gatlinburg and enjoy the seclusion and privacy of your own mountain hideaway. You will need no excuse to enjoy the amazing jacuzzi in A Great Escape Chalet, which is set beneath floor-to-ceiling windows on two walls in a corner of the house. With its secluded setting on Ski Mountain, you will love looking out on the trees and mountains as the whirlpool jets massage you. Another feature you are sure to enjoy is the two-sided gas fireplace, with one side in your living area and the other next to your king-size bed. Turn on the flames and cuddle up together to watch them flicker. The large back porch features a hot tub, perfect for watching the stars and snuggling up in the crisp mountain air. There is even a pool table if you are in the mood for a little competition. You will not mind having Cabin Fever in this beautiful, custom-designed log cabin. The back porch has a lovely view of the Smokies and a covered hot tub in which to get close to nature. The rustic living room has a large stone-stacked gas fireplace with a large hearth and a comfy sofa on which to lounge. There are a pair of king bedrooms, one of which has a four-post bed underneath beautiful wooden eaves in the loft. For another stunning view, consider Bear Paws, which overlooks a beautiful section of the Smokies. The large back porch has a hot tub from which to take in the view or you can cozy up in the cabin’s very own sauna. 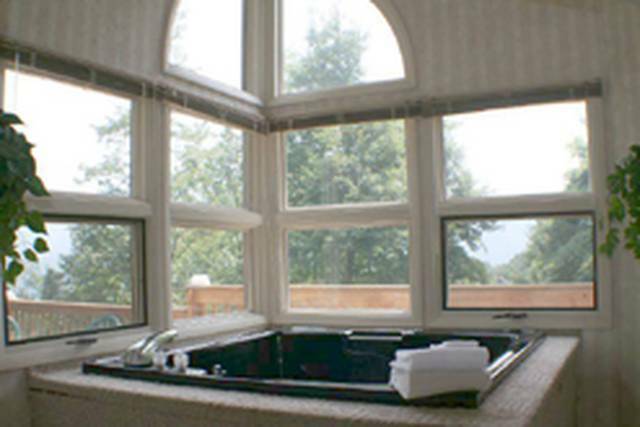 The jacuzzi is set overlooking the deck, with windows on three sides so the view is never far away—if you can keep your eyes off each other, that is! A large fireplace and a pair of king-sized bedrooms completes the picture. Find a cozy corner in the Owl’s Nest and watch out for wildlife walking by, with majestic black bears and sleek coyotes known to pass nearby. This A-Frame chalet overlooks the Smokies and Gatlinburg and features a wrap-around porch from which to really take in the view. The hot tub is nestled into its corner of the deck and is covered for enjoyment in all weather. With a full, updated kitchen, you have the option to have your meals alone and take advantage of this great location. For a truly memorable Smoky Mountain honeymoon, create your own fairy tale at Oberbaden, an eye-catching chalet that mixes a red-trimmed roof and beautiful teal-green wood, nestled into a wooded spot. OberBaden is one of the original A-Frame cabins in Gatlinburg and has three floors to explore together. The top level has a large bedroom with a king bed and both bath and shower. The great room has a fireplace with flatscreen television above, perfect for a favorite flick. Whichever of these honeymoon cabins that you choose, your mountain hideaway has everything you need in a romantic setting perfect for newlyweds.